I toured more than a dozen gardens this weekend and saw lots of creative ideas, from antiques in the garden to exciting plant combinations. 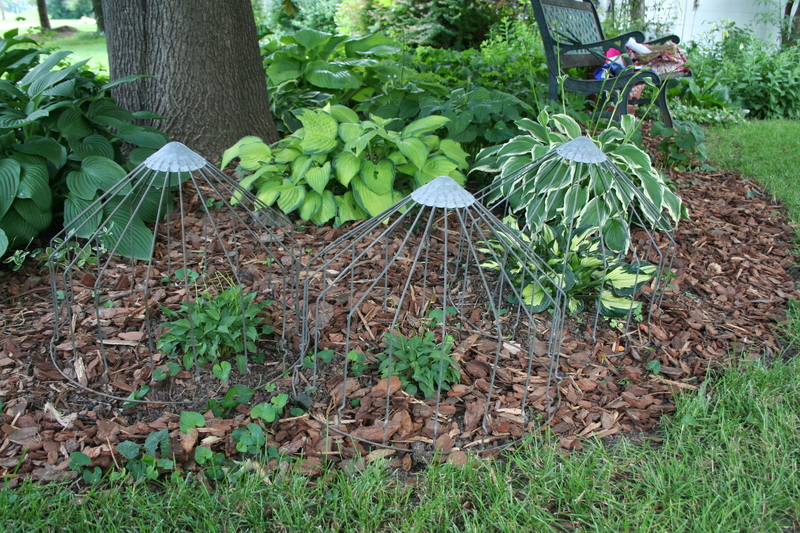 Two of my favorite ideas were ways to protect plants from marauding critters. Deer don’t like rubbing their noses in pointy tomato cages. This contraption is a deer deterrent in a large rural garden near Hudson, Wis. No doubt deer are a constant problem in this area, but the home owner has out-smarted them with these home-crafted cages. The cages are made from regular tomato cages, turned upside down, with the pointy ends twisted outward. Apparently, deer stub their noses on the cages when they come to browse the hostas and so they move on to less difficult territory. 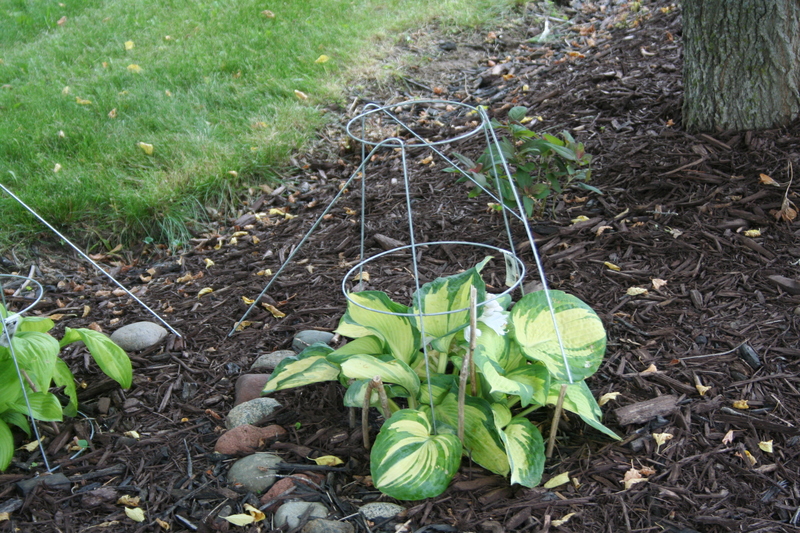 An antique water dish cover used for chickens protects hostas from rabbits. These covers for hosta plants were intended to cover a chicken’s water dish, according to the South St. Paul gardener who found them at an estate sale. The chickens could get their beaks through to get water but could not fowl the water in anyway. The gardener uses them to keep rabbits from munching on her hostas. Have you heard of other creative ideas for keeping critters at bay? « Photo Gallery: Artful Gardens in Hudson, Wis. I have no good ideas, just complaints. We fenced in the vegetable garden so that it looks like Stalag 17, and it is safe from deer, but not rabbits. Where are the coyotes when you need them? We had terrible rabbit problems this year until our recent deluge of rain. I’m not sure if the bunnies drowned or moved on, but I have not seen any since then. Unfortunately, plenty of ground squirrels and moles still. I use all sorts of deterrents to keep the deer out of our driveway garden, the location with the most sunshine in our clearing in the woods. Nothing works for all season, but a variety of things seem to be working this year. Other than some nibbling late June we’ve been fortunate. Bloodmeal in pantyhose bags tied to supports. Eggs – any cracked from our chickens or doves goes out there mixed up a bit in a bucket with water or just tossed on the mulch for the aroma once rotten in the heat. Dog urine – I walk our little pomeranian around the perimeter & take him with me when working in the garden in hopes that his scent will deter them. Alliums planted near the perimeter – chives in the retaining concrete blocks plus garlic & onions in rows in front, between & behind the strawberries all along the driveway. Great suggestions! 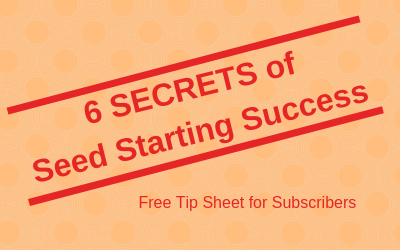 With deer, it seems you have to constantly change what you are doing to keep them at bay. Great ideas to keep critters away from your garden! This is also a fantastic way to avoid infestations because the critters will move on to better places to get food. Great work and insight, thank you!